BEIRUT (AP) — U.S.-backed fighters have seized a key Islamic State stronghold in northern Syria after two months of heavy fighting and freed hundreds of civilians the extremists had used as human shields, Syrian Kurdish officials and an opposition activist group said Saturday. Nasser Haj Mansour, of the predominantly Kurdish Syria Democratic Forces told The Associated Press that the town of Manbij "is under full control," adding that operations are ongoing to search for any IS militants who might have stayed behind. The SDF launched its offensive in late May to capture Manbij under the cover of U.S.-led airstrikes. 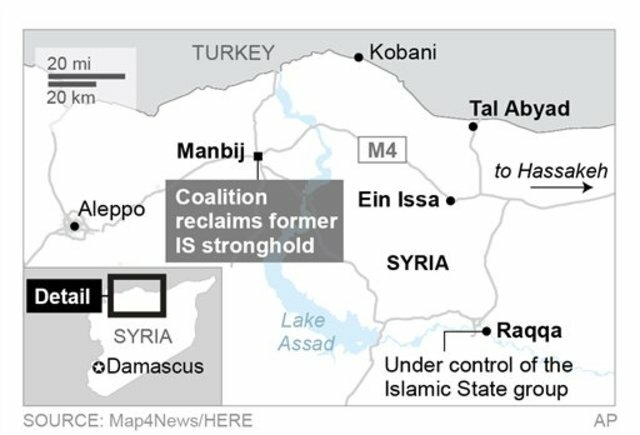 The town lies on a key supply route between the Turkish border and the city of Raqqa, the de facto capital of the IS group's self-styled caliphate. Amateur videos posted online showed that shortly after SDF fighters captured the town late Friday, scores of residents went down to celebrate in the streets. Some men were seen clipping their beards with scissors while women were able to uncover their faces. IS imposes a harsh and extreme version of Islam on the territory under its control, including a mandatory dress code. "May God destroy them. They slaughtered us," a young man shouted in a Manbij square. "May they not live for a minute." The videos appeared genuine and corresponded to Associated Press reporting of events. In a photo posted online by Kurdish activists, a young woman defiantly uncovered her face while smoking a cigarette and flashing a victory sign. Under the extremists' reign, women had to wear long black cloaks that covered all but their eyes, while all adult men were forced to grow beards. Smoking was banned. Haj Mansour said some IS fighters were captured in the town while others fled to nearby villages. "Military operations will continue until these villages are clean," Haj Mansour said. Sherfan Darwish, another SDF official in Manbij, also confirmed that the town is under the full control of his fighters. The Britain-based Syrian Observatory for Human Rights said that with the capture of Manbij, hundreds of civilians that IS used as human shields are now free. For weeks, SDF fighters have been slowly advancing in the town and nearby villages over the past weeks. The fighting and the airstrikes have killed some 450 people, according to the Observatory. IS has suffered major defeats over the past months in Syria and Iraq, where the military recaptured the cities of Ramadi and Fallujah in the western Anbar province. However, IS still controls large parts of Syria as well as Iraq's second largest city, Mosul.